Then one of the Temple guards standing nearby slapped Jesus across the face. "Is that the way to answer the high priest?" he demanded. Jesus replied, "If I said anything wrong, you must prove it. But if I'm speaking the truth, why are you beating me?" 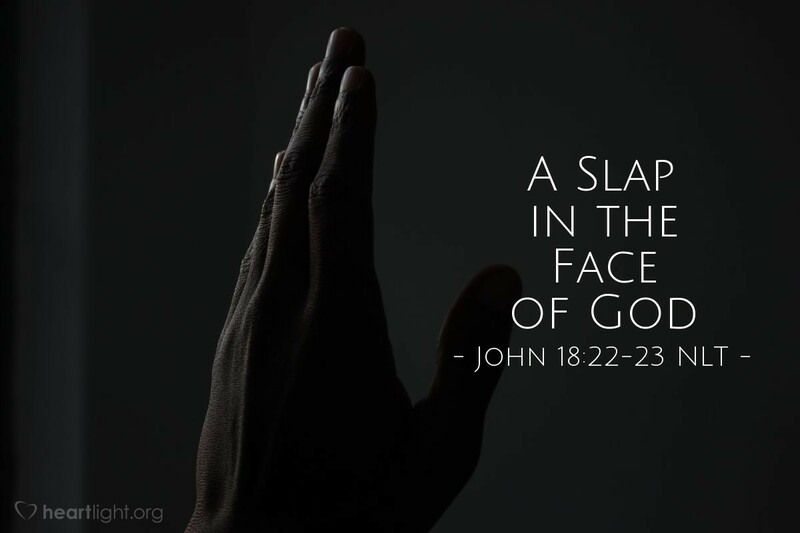 The Temple guard didn't know it at the time, but he was not only slapping the face of a high priest far greater than the one he was protecting; he was also slapping God in the face. Jesus suffered many indignities in his trial and crucifixion. However, it was a greater tragedy that those who inflicted these horrible cruelties never had any idea that they were abusing the Son of God, the Messiah that God had sent to redeem them. Yet Jesus suffered these indignities so that we could know that he loves us and will help us in our times of rejection and need! Father, thank you for your forgiveness. Thank you for your patience. Thank you for your long-suffering kindness. Thank you for your overwhelming grace. I see these qualities demonstrated in Jesus' willingness to submit to humiliation, abuse, and torture so that the very ones who hurt him could come to know you as their Father and find your saving grace. I know that same grace is given to me. I praise you and thank you in Jesus' name. Amen.